A straight forward and unforgiving design. Part combat knife, part shank, part collectible. 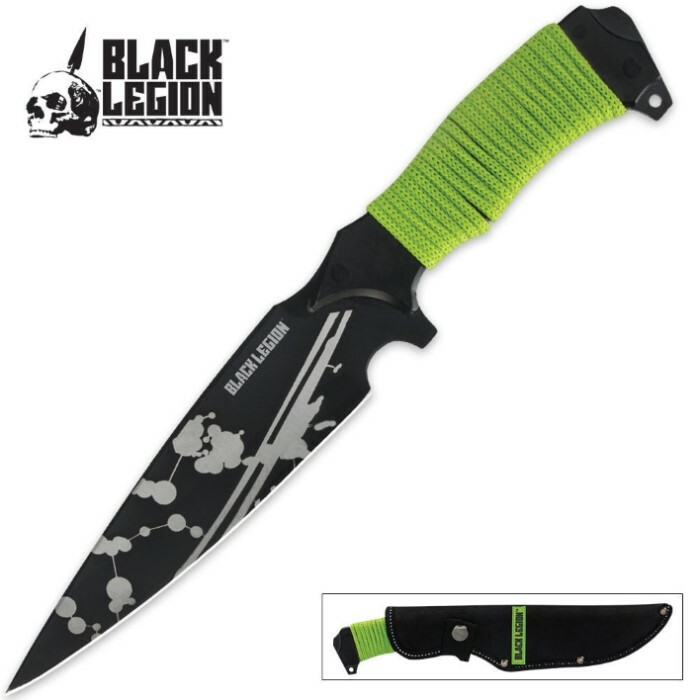 Our Zombie Spike Knife features a solid full tang construction with synthetic handle scales and green cord wrapping. The blade comes sharpened and is finished in black with an "acid blood" splatter effect. The tang extends past the bottom of the handle allowing for use as an impact weapon, and lashing holes are located on either end of the handle. A nylon sheath with belt loop is included. Measurements: 7 in. blade, 12 in. overall. I bought this last week and it came in today and I must say EXCELLENT WORK this knife is amazing and the size is phenomenal!! The sheath is great and I like the green cord for the handle if I could recommend this to anyone I would most definitely the best knife for the best price!!! Very well built and balanced knife..very sharp out of the box. I am very happy with this purchase so much that I bought 2 more. Well, first off, it's way bigger than i expected it to be; the blade is just massive. The sheath is better than the sheath on most $10 dollar knives, and the knife is solid. The reason for only 4 stars: the handle wrapping is a bit low quality, but that can be fixed with about a minute and a lighter. I saw this thing and i didn't really pay attention to the description, i just thought it looked cool and i was a great price for something i thought would be a little boot knife or something of that size...this thing is a friken Bowie knife! I just thought i got the wrong thing in the mail and was all like "Dude! what happened to the little knife?! did the big one eat it?!!" I am very happy with what i got but i just wasn't expecting it. Its a little back heavy, didn't come very sharp, and i don't like the green cord so i replaced it with some black para-cord i have and it looks beast now. I got this knife and it was sharp out of the box! I dropped it (by accident) and the point went clean through the floor like butter! Very well made,handle is three pieces of heavy stainless mated together very durable,the blade is much larger then I thought it would be and super sharp!The sheath is very nice for the price of this blade,you are buying the blade and sheath is free or look at it in reverse!Very nice deal for the money,would have paid 10 times the amount and still been happy,love you Budk!! !